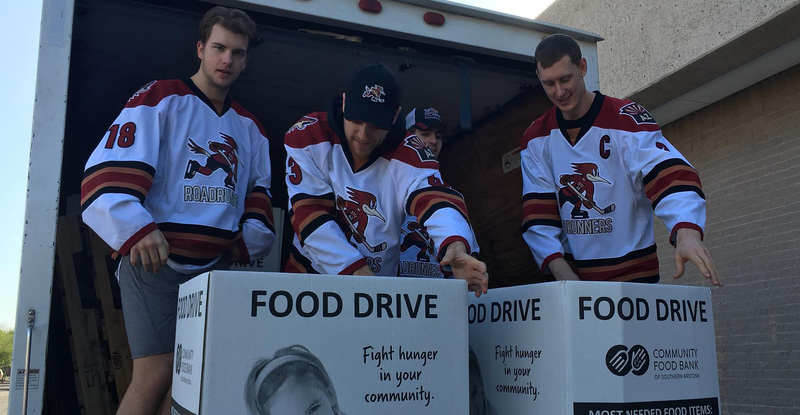 TUCSON, AZ – The Tucson Roadrunners, proud American Hockey League affiliate of the Arizona Coyotes, finalized their contribution to the Community Food Bank of Southern Arizona on Saturday, donating a collected 749 lbs. worth of food. The food was donated by Roadrunners fans and collected during the team’s home games on December 12 and 13 against the San Jose Barracuda. Following the collection, Roadrunners players volunteered their time in ensuring the delivery to the Food Bank. In Arizona, one in four children are at risk for hunger, as well as one in five adults. The holidays bring on a high demand and the generosity of donors helps the Community Food Bank of Southern Arizona provide food in response. Tickets for all 19 remaining Roadrunners home games, including tonight’s Star Wars Night, are on sale now and can be purchased by clicking HERE or visiting the Tucson Convention Center box office. For more information on the club, call 866-774-6253.